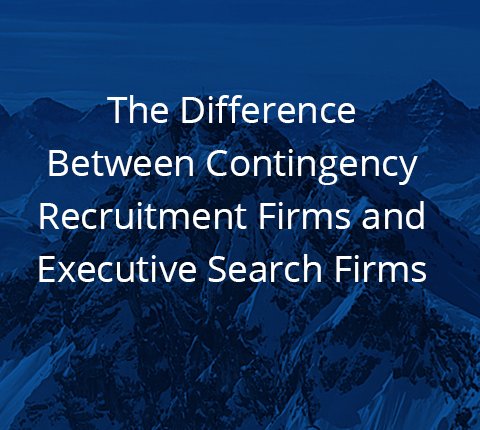 If you are in the process of filling a C-suite vacancy for your healthcare organization and you are considering engaging a search firm, it is very important for you to look at the differences between contingency recruitment firms and executive search firms. There are some striking differences between the two. This can affect the quality of the person who is placed into your organization which can, in turn, affect the health of your organization. Contingency recruiters tend to be larger companies who look to complete as many searches as possible in the shortest span of time. The teams at these recruiting firms work on multiple searches at the same time. They often take no money up front and are only paid when the candidates they present are placed. Contingency recruitment firms are often approached by candidates who are actively searching for a new position. Candidates who are already in the market for a new position are more likely to be “window shopping” with the intent to use multiple job offers to negotiate better compensation. These candidates tend to be in mid-management roles, and are looking to move up the corporate ladder. They will have a history of frequent job changes and short tenures. When these recruiting firms present their candidates, they will deliver large batches of talent. Many times, the resumes for the talent will not fit the levels of experience needed. Because the recruiter is working with such a large pool of people, they are not vetting the candidates to make sure they are the right cultural fit and that they are truly ready to commit to your organization and its mission. They may have the right certifications, but may not be the right hire for you. Engaging a healthcare recruiter can work, but it can also have disastrous results. Because these firms don’t have the resources or time to truly dive into a search engagement, they may not find the right talent for your vacancy. If they do, the candidate may look good on paper, but once they are placed in your organization they may not be the proper fit. Often, these firms will drop a search if they cannot find talent on a timely basis, leaving you to start the search all over again, or expecting that multiple contingency recruiting firms are conducting the search for candidates. It is not that recruiting firms do not want to build relationships, but the nature of how they conduct business makes it more challenging for them to do so consistently. Executive search firms (sometimes called retained firms) work on an exclusive basis and are client focused. They limit the number of engagements they take at any one time, and the principals at these firms do not delegate important search tasks to less experienced team members. Executive search firms work to find the best talent for their clients, even if that candidate is not actively looking for a new position. The goal of an executive healthcare search firm is to find, ‘woo’, and secure the best talent for your healthcare organization. Executive search firms are involved in every single step of the search process. They assist with designing the search, refining job offers, planning the interviews, work on candidate on-boarding and even follow-up after the search is complete to ascertain that things are working out as expected. Executive firms work on a different payment model than contingency recruiters. Executive firms work on retainer for the search engagement, allowing the firm to conduct in-depth analysis and advisory tasks. Executive search firms are focused on delivering high-quality, personalized service and highly vetted candidates who will thrive and have longevity in their new positions, all with the goal of building long-term relationships with their clients. Their goal is to earn and maintain the trust of their clients in order to become an exclusive search firm for their clients. Because of this, executive search firms are incredibly hands-on. These retained firms will work alongside the HR department, leaders, and Boards of Directors to get a full understanding of the organization’s goals, strengths, and needs. An effective executive search firm will conduct interviews with the goal of understanding the culture that drives the organization. This is key so that they are able to predict the impact that candidates could have once they are brought into the organization and so that they are able to secure an enduring and effective executive placement for their client. The people who make up the teams at executive search firms have a strong grasp of the healthcare field and of their client’s business strategies. The best healthcare executive search firms will be made up of professionals with in-depth experience in healthcare. This experience and the connections they have made throughout their careers will give this team access to C-suite and senior executives who are not actively looking to move into a new position. Because these firms are discreet, they will be able to convey the benefits of making a career move to these highly specialized candidates. At Summit Talent Group, we are proud to say that we work as a boutique executive search firm. When you work with one of our principals, you can be certain that it is he or she who will be leading the search. We will guide you through every step of the process. We start off by establishing a timeline that will be your roadmap to the search engagement. This timeline will also allow you to plan ahead and prepare for your new team member to come on board. Then, we conduct interviews with principals and stakeholders at your organization with the goal of getting a full understanding of what you do, why you do it, and the type of talent you need to help you do it better. We go further than getting to know your organization; we then move on to getting to know your community, your city, your environment. This is done so that when we begin to look at talent, we can determine if they will fit into this new environment. This is one of many ways we can establish if the talent has the potential to thrive both at your organization and its home. The next step is to put together the job specification and competencies. By having an accurate description of the position and everything attached to it (financials, qualifications, objectives), we become more capable of asking the right questions and of having an in-depth dialogue with candidates to determine if they could be a good match. Once we have narrowed down the talent to the best matches for your organization, we are there to assist with the interview process. We help you to draft questions that will allow you to decide which of the candidates will receive the job offer. Finally, we will work with you to execute the job offer, everything from compensation, signing bonuses, moving assistance, and more to ensure that the transition is a smooth and pleasant one. If you would like to speak with us about how we can help you with your executive search needs, contact us. We look forward to becoming your healthcare search partners.